The Final WRIA 8 Chinook Salmon Conservation Plan recommends actions to restore and protect habitat that salmon need to survive in the Lake Washington/ Cedar/ Sammamish Watershed. Developed through a collaboration of citizens, scientists, community, business, and environmental groups, local elected officials, and public agency staff, the science-based plan has been ratified by 24 local governments. The intent is to lead the region toward a legacy of healthy, harvestable salmon and improved water quality for future generations. 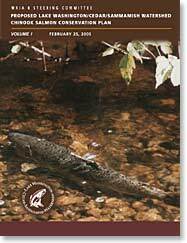 The Final WRIA 8 Chinook Salmon Conservation Plan is available in Adobe Acrobat format. For help using Acrobat files, please visit our Acrobat help page. The document is available in sections for faster access and to minimize computer problems during and after download.